Dream of drifting among the Caribbean Islands with a G&T in hand, watching the world go by, or screaming along Sydney Harbour at the end of a wire on an 18ft Skiff? This eBook will show you how to start on your journey. There’s more to sailing than hauling up the sails and heading on your merry way. You have to be self sufficient, and the further you go the better trained you should be. If you plan on blasting around the buoys at your sailing club every Sunday then you need to get one level of expertise – packing your family off on a round-the-world cruise, quite another level of skills. Up to the point of world yacht cruising and club dinghy racing this book will tell you exactly what you need to learn to sail, wherever you are in the world. 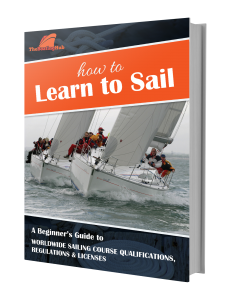 As well as discussing the courses you’ll need to take in each country it provides information on the qualifications required, country specific sailing regulations and the licenses you will need wherever you plan to sail. 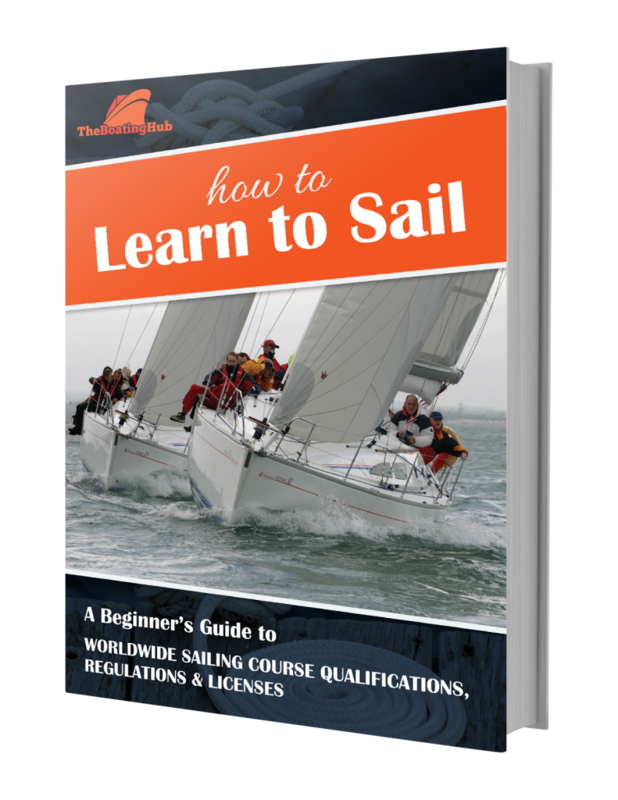 Why Should I Download The Learn To Sail eBook? It’s your one stop, handy guide to take sailing to the next level and find out how best to get proper accreditation. What courses do I need to take to learn to sail a yacht or dinghy in a specific country? What are the regulations for sailing in a specific country? What licenses do I need to sail in a specific country? Scroll Down To Download eBook. Who Is This ‘FREE’ eBook Aimed At? This book is aimed at the complete novice who wants to learn to sail, wherever in the world you happen to be. It also helps intermediate or advanced sailors who are looking to venture into foreign waters, but are confused as to the regulations and licenses required where they want to sail. You might have just got back to the US after a holiday in St Barth’s where you saw one of their many sailing regattas and want a piece of the action. You might be in Cape Town having just seen the Volvo Ocean Race circus drop by for two weeks, or you may have been watching dinghies blast around your local reservoir while on a walk… you have the sailing bug! While researching this book, we found a Czech sailor who was living in the UK but wanted to charter a boat on the Mediterranean, but didn’t know how to get qualified to sail a charter yacht. With this eBook he would have learned exactly what qualifications and licenses he needed, in about 30 seconds! This book will show you (for both dinghies and yachts) how to progress from being a complete novice to an ocean going expert, no matter where you live. Scroll Down To Download eBook Today! What Sailing Courses Are Discussed? There are all sorts of directions you might go in sailing. Youngsters of today will dream of joining the Volvo Ocean Race one day or perhaps even the America’s Cup. This eBook brings together all the world’s sailing qualifications and shows you what you need, and how to get it. We have kept it simple and focused. We look at beginner’s courses, and how to progress to an intermediate and advanced amateur. In many countries, an ‘advanced amateur’ can safely sail a 40ft yacht through a Pacific storm, a thousand miles offshore, with some hope of telling the story in the bar when they reach port! From the top amateur qualifications we discuss, you can go on to professional qualifications, whether coaching or professional skippering. Many countries in the world have no formal training and certification system for learning to sail, whilst some countries don’t recognise other countries’ national certifications. For example; in Europe, due to the difference in national sailing certification requirements between so many countries in such a small geographical area, there is a scheme called the International Certificate of Competence that allows you to get one qualification to sail anywhere in Europe. We’ve also included a section devoted to international qualifications including the International Yacht Training (IYT) scheme, Royal Yachting Association (RYA) and American Sailing Association (ASA). These certification schemes are widely recognised all over the world. What Regions Of The World Are Covered? This eBook covers every country in the world who adopt a national sailing certification system. Researching it, we found that there are only around 50 such schemes. Notable countries without such a scheme are China, India, Brazil and Russia, and there is only one scheme in Africa. As such, you won’t be able to do a nationally recognised qualification in most of the world! In these countries you will need to consider an international scheme such as a Royal Yachting Association (RYA), International Yacht Training (IYT) or American Sailing Association (ASA) course. How Is The eBook Organised? It is organised in a simple fashion by region, with a clickable table of contents. and Singapore, Rest of the World. The eBook is FREE. All we ask from you is your name and email address so that we can send you future eBook releases. You can unsubscribe at anytime. We respect your privacy and will NEVER pass your email address to any third party. That’s a promise! Belgium, Denmark, Estonia, France, Germany, Ireland, Latvia, Lithuania, Luxembourg, Poland, The Netherlands, United Kingdom. Austria, Czech Republic, Hungary, Romania, Slovakia, Switzerland. Albania, Bulgaria, Croatia, Cyprus, Greece, Italy, Malta, Montenegro, Portugal, Slovenia, Spain. Antigua and Barbuda, Aruba, Barbados, Bahamas, Belize, Canada, Cuba, Dominican Republic, Guadeloupe, Jamaica, Martinique, Saint Barthelemy (St Barth’s), Saint Martin, USA. Argentina, Belize, Brazil, Chile, French Guiana, Mexico, Uruguay, Venezuela. Australia, French Polynesia, Japan, New Zealand. China, India, Russia, Singapore, South Africa. Are You a Sailing School/Instructor?